El Otro Lado: The Other Side - Albuquerque in 2010 is building on the discoveries and practices that evolved during the two-year project in Santa Fe. The Academy for the Love of Learning is pleased to be partnering with 516 ARTS, La Plaza de Encuentro, and Connecting Community Voices to ensure that this project will be rooted in the Albuquerque community. Workshops led by visual artist Chrissie Orr and writer Michelle Otero started in February and are being held once a week at the Native American Community Academy, El Centro de Igualdad y Derechos, and Barelas Senior Center. The public was invited to participate in free workshops at West Side Community Center. Work gathered in the workshops will be transformed into a public art installation that will be shown at various Albuquerque sites and featured in a public storytelling event in the fall. Chrissie Orr and Michelle Otero say, "We have witnessed the power of creative expression through participants' collages, poetry, and watercolors. This expression, in turn, has led to moments of human connection between participants. We are just beginning." Chrissie and Michelle are assisted by a creative team of supporting artists and technicians, David Gordon, Pablo Ancona, Senaida Garcia, Alicia Lueras Maldonado, Adrianna Ontiveros, Niki Lewin, and Barbara Geary. El Otro Lado workshop participants in Albuquerque have come from Mora County, Alamogordo, Magdalena, Española, Carnuel, Colombia, and México, and they all have found a home at the Barelas Senior Center. Each week, Chrissie and Michelle were joined by women and men who came brimming with stories of childhood in villages throughout New Mexico, their first car, raising children, boarding school, horseback riding, living alone or returning to live with adult children and grandchildren. One day as they were painting self-portraits, Cecilia burst into song, gifting us with an old ranchera from her childhood about a woman who was done with her suitor. Her voice was infectious and soon Ray sang to us about a sweetie. Accompanying them as always was Sarah's boisterous laughter. 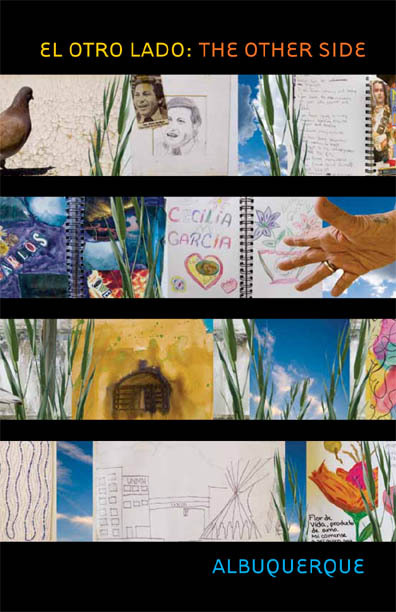 Like the center itself, participant journals became another kind of home. In them, they told the stories of their names, collaged symbols and images that speak to their identity, and wrote “I am from” poems. Sarah is “from caballos, conejos, vacas, y chivos.” Ray is from “los dichos de mi papá: Arbol que nace torcido, jamas su tronco endereza. Díme con quién andas, y te dire quién eres." Now in his nineties, Ray had kept a sketch journal throughout most of his adult life, filling it with newspaper clippings and photographs on one page, and his sketches on the facing page. Like many of the Barelas participants, Ray had not painted or drawn or written for years. The workshop reconnected him and others to the creative outlets they had enjoyed as younger men and women. The creative process enabled these participants to not only reflect on memories of the past, but to find and reflect on the beauty of their lives now. We worked with students in Cy Evans' art class and a smaller group of young men, who were brought together by Dean of Students, Mateo Sanchez. The high schoolers come from New Mexico Pueblos, the Navajo Nation, and Albuquerque. They are athletes, dancers, science whizzes, artists, and ranchers. Many would take their journals home each week to complete the exercises we began in class and return with elaborate collages that showed the many facets of their lives. Over the summer, journals traveled with students to a sundance in South Dakota, an enrichment experience in Andover, Massachusetts, and a family ranch in Vanderwagen. For those who must travel back and forth every day from distant towns and pueblos, their journals continue to act as a bridge between the worlds they are from and the one in which they receive a formal education. Between twelve and twenty young people came to El Centro each week ready to dive into their journals, whether the medium was collage, writing or watercolor. They are students at Highland, Albuquerque High, St. Pius, Amy Biehl, South Valley Academy, CNM, and UNM. They brought family photographs to paste into their collages and music to share with the group as they painted or wrote. Though many of them had worked together as young organizers for immigrants' rights, through the creative process, they developed an even deeper sense of trust with one another, sharing aspirations and disappointments, reading powerful poetry of their stories of migration and adaptation. Their life maps, self-portraits, and "I am from" poems reflect their duality as bilingual and bicultural young Latinos in the U.S. Through their expression, they incorporate the strengths of both cultures, countries, and languages to create a tapestry that is uniquely Albuquerque, uniquely American. Each Wednesday morning at 9am, we sat quietly in the back room at West Side Community Center, waiting for participants to arrive from the New America School, just a ten-minute walk from the Center. As the twenty-plus teenagers burst through the hall and kitchen doors, we wondered how the space could have ever felt quiet or still. The West Side group was composed of students in Mr. Fabian Sisneros' English classes at New America, an alum from our group at Barelas Senior Center, and two women from the community who learned about the workshop through the 516 ARTS events calendar. Together they made up our most eclectic, challenging, and energetic group. Sarah, our group elder, traveled deeper into her journal, painting family portraits in watercolors and acrylics. She had a calming effect on the young people. Regardless of what they are doing, when she spoke, they turn their attention and their respect to her. At first, many of the teens gravitated toward markers, pens, and colored pencils. When pushed to try watercolors on his life map, Antonio replied, "How do you use them, Miss?" Many of the young people are using art supplies for the first time. Some discovered that they love poetry. Others took their journals home and returned each week with new photos and poems. On a challenging Spring day with some students absent, others on a field trip, and several restless and barely able to stay in their seats, Mr. Sisneros approached us to thank us for our work, "They do more work here than in any other class."